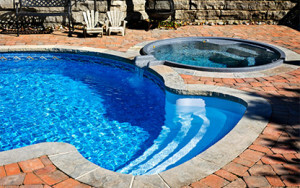 Need Pool Services in Las Vegas? Enjoy crystal clear water all year long with professional pool services Las Vegas from Pool Chlor. Includes all chemicals- chlorine, acid, conditioner, tablets etc. pool water balanced: pH, chlorine level, alkalinity, hardness, conditioner. No extra or hidden charges. Extra service is free. No start-up fees except for green or fresh water pools-$30. Same day response to algae or pool problems. Always same day and about same time. No contract- Try us for a month. Pool Chlor Vacuuming service includes vacuuming, brushing, cleaning out baskets and netting surface. Vacuuming service starts at $68 per month extra for twice per month. With chemical service a total of $110 per month. For pools located in the South-west part of the valley-$68 per month. On the South-east side of the valley-$75 per month. In the North-East and North-West $80 per month. Filter cleaning is an extra for $65. Filters require cleaning every 3-6 months.